The cornflower is a beautiful flower native to the Mediterranean, but it’s often found growing randomly in fields and at roadsides in the U.S. 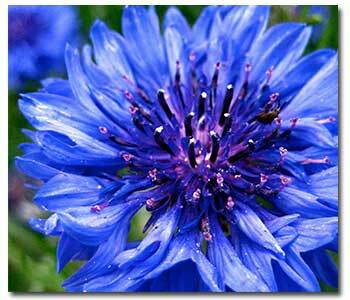 The cornflower is known for its intense blue, but is also found in pink, lavender, maroon, red and white. This pretty plant is identified by its daisy-like blossoms, sitting atop slender green stems that are often covered by fine white hair. The cornflower has distinctive, lace-shaped leaves ranging from 1.6” to 4.6” with pointy tips. The cornflower grows anywhere from eight to 32”, each plant producing multiple flowers, typically blooming in early to mid-summer. Also known as basket flower, blue bottles, and bachelor’s button, the cornflower is often used as a border plant; but many people use it in arrangements. It also makes the perfect blue for patriotic July 4th garden. Most cornflowers are annuals, though it’s possible to find a few perennial varieties. The hardy cornflower grows easily from seed, and can be started right in your garden. Very little is required to grow these beautiful flowers: the seeds (obviously), a trowel to loosen the soil, and water. Add containers to the list if you’re growing a container garden or are starting the plants indoors. Cornflowers prefer average, well-drained soil with a pH of about 6.5-7.0. While they can tolerate hot, dry weather, regular watering is best. If you’re planting outdoors, turn the soil and scatter the seeds. Cover them with about ½” of soil and pat gently. Lightly water the soil; your goal is to keep it moist, but not soggy. Seedlings appear in 7-25 days, at which point you’ll need to thin them to between six and 12” apart. You can begin growing indoors for later transplant, too. Wash containers with one part bleach to 10 parts water and let them air dry; this kills off undesirable bacteria that might affect your plants. Fill your containers with soil, about 1” from the rim. Sow 2-3 seeds per container and cover with about ½” of soil. Cover the containers with plastic wrap until the seedlings emerge; remove the plastic and place the seedlings in a sunny window. You may also choose to use pre-filled pods, available at your local Grangetto’s. Once the seedlings are about 2” tall and have grown their true leaves – the second set of leaves – thin all but the healthiest-looking one, which will be transplanted. You may choose to “harden” your seedlings before transplant. Put the containers outdoors for couple hours increasing the time outside each day for one-two weeks. Transplant your seedlings before they reach 4” in height and do so about 12” apart. The cornflower does well in containers, too. If you have little space for a full garden, simply follow the procedure for growing indoors. When the plants are hardened, leave them outside. Regardless of where they’re planted, if you want your plant to have more branches, pinch back the tips as the plants are growing. Likewise for more flowers, remove blooms when they begin to wilt. Corn flowers are disease-resistant, but they are susceptible to aphids. If you notice aphids attacking your plants, you can spray the leaves to knock them off or simply remove the affected leaves. There are insecticides available to control these pests as well, stop by and ask us which product will work best. Another alternative is to introduce ladybugs into your garden, as ladybugs have an insatiable appetite for aphids.